Your day card may provide insights into current or up coming events in your life or may just provide an idea to think about. A day card can also be used simply for learning the Tarot one card/day at a time. This card could represent a person you know or will encounter or some aspect of yourself that is present or to call upon now. The King of Cups is emotionally mature. He is able to observe his emotions and respond in wise ways to them. He is a wonderful counselor and adviser. He is a careful, empathetic and understanding listener. He gives good advice and makes a wonderful mediator. He has a big heart, is extremely caring and makes a wonderful husband and father. He is imaginative and able to channel his emotions in creative ways. He loves the arts and beautiful things. He may seem emotionally detached, but this is only because he is calm and mature, not because he doesn’t care. Motivation: The motivation to start a family, which could include a proposal or suggestion to the wife to have children. Motivation to be a new and better provider, father and husband, or be more emotionally mature. As an Adult Man: Call him “The Godfather.” A kinder, gentler, more loving man you’ll never meet. His “kingdom” is his family, and his one dream is to be sitting at the head of a huge table filled with kin, kids, grand kids, serving up food to them all. He is paterfamilias, the father as capable of rocking babies to sleep, bandaging hurts and telling bedtime stories as he is at coaching a sports team or offering fatherly advice. His family always comes first; for them he’ll work, sacrifice, do just about anything; and, yes, like the “Godfather” he will consider doing terrible things to anyone who causes them grief. This King understands emotions and is a master of his own emotions. As such, his ambition is to have a Kingdom where everyone is emotionally mature, meaning courtly and civil. Hence, he motivates his family, friends and community to be more neighborly and polite and responsible for each others well being. To be, if you will, conscious of each others feelings. This is why he’s sometimes seen in the occupation of a judge, as he is very sensitive to fairness and knows how to put himself in another shoes, to understand why they did what they did. 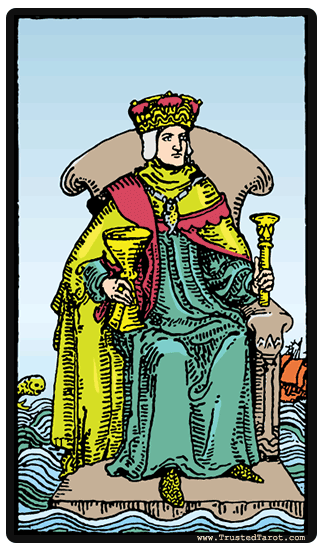 Very like the Queen of Cups, however, he can be too soft and sentimental. No matter how prodigal the son, this father will always bail the kid out. It is almost impossible to make him see reason when it comes to his family. And there is another problem: like his queen, he’s not above manipulating emotions to get what he wants, especially if he’s trying to keep those he loves close to him. He also, like all the Cup Courts, may tend toward depression or alcoholism. At his best, however, this is the man the whole neighborhood thinks of as “Dad.” Whether he really is their father or just a surrogate, he is the one who settles disputes, the one they go to when they’re in need of guidance. He is the father figure that every father aspires to be.